Thank you for agreeing to this interview. First, can you tell us briefly about yourself? What led you down the path of authorhood and why fantasy and science fiction? You’re welcome. About myself… I’m a middle-aged spinster aunt living in Pismo Beach, California, with my parrot Harry. I was frequently ill as a child and my mother saw to it that I had plenty of books to read, early and often. She also wanted me to become a writer, which for many years I resolutely refused to do– publicly, anyway. Privately I filled several volumes with stuff, mostly set in a fantasy world I’d invented. What I did publicly was join the Living History Center, who put on the original Renaissance Faire, which was nothing like the plastic models now in circulation. It was an educational extravaganza, painfully authentic and absolutely magical. I taught Elizabethan English as a Second Language for them for close to thirty years, and worked as an actress, stage manager and occasional dramaturge as well. This gave me a lot of what you could call unique life experience, so by the time I finally gave in and began to sell what I wrote, I had a lot of material with which to work. Why fantasy and science fiction? Fantasy because I was inclined that way, and science fiction as an offering to my mother’s ghost. She loved science fiction. Who have been some of your influences, whether in writing or some other hobby or profession? What are some of your favorite books? Oh, gosh… Shakespeare, especially A Midsummer Night’s Dream, and it’s affected me in so many ways: wanting to escape to the Wood Near Athens as a child, watching the filmed versions, reading it and savoring the words, watching it being staged Elizabethan-style on a crude wooden stage in an oak forest… All the works of Robert Louis Stevenson, but most especially Treasure Island. C.S. Lewis and Edward Eager and Elizabeth Enright. L. Frank Baum. All their books. Patrick O’Brian’s Aubrey-Maturin series takes my breath away. I’ll read anything Terry Pratchett writes, and his books for kids are even better than his books for adults. The Asterix the Gaul comics. The Flashman novels. Thorne Smith’s supernatural comedies. Peter S. Beagle! Way too many others to mention. The House of the Stag is the second book set in this particular world. What drew you to return to this world? And what about the fantasy genre made you want to return? Actually, The House of the Stag is drawn directly from the huge fantasy world about which I’d been writing from the age of nine or so. Gard’s story is the oldest part. When I was trying to earn money at my craft as an adult, I adapted a minor incident concerning one of Gard’s sons into a short story and sent it out to test the waters, as it were. The story was favorably received, so I went ahead and wrote the first part of the triptych that became The Anvil of the World, my first published fantasy book. Tor was interested in a second fantasy novel, so I went back to my original source material and revised it, and rewrote it (because you may think you know everything when you’re fourteen, but by the time you’re fifty-three your perspective has changed somewhat). Et voila! The House of the Stag. One of the powerful features of this book is how it takes an otherwise cliché plot and twists it on its head. Your novel seems keenly aware of the past of its genre (fantasy), including delving into aspects of myth and fairytale. What do you see as the connection between modern (contemporary) fantasy and the stories of our past? Do you see The House of the Stag as a novel that breaks convention (in a good way)? I hope it breaks convention in a good way, certainly… Here’s the other disadvantage of writing from a fourteen-year-old’s perspective, especially at a time when Tolkien was God and trilogies set in immense detailed universes were what every aspiring young writer set out to create: you don’t realize you’re not being terribly original. But by the time you’re older and you’ve read your Joseph Campbell and you’ve seen all the really cheesy Tolkien knockoffs that make millions at the cost of their muses, and you’ve read a bit of the sort of things Tolkien’s contemporaries were writing, you see the field in a new light. My story involved a foundling coming of age and discovering who he was and what his heritage entailed, which is one o’ them there Universal Themes, and it helps that he discovers that his destiny is to be the world’s Bad Guy, but even so– it seemed to me it was wiser to pare it down to its essential myth, and tell it not as an Oxford don would tell it, but as people would tell it. And just incidentally using that incident in which Gard becomes an actor to comment on the larger Epic Fantasy tradition… sort of getting a dig in. The House of the Stag also deals with issues of identity, slavery, and colonialism, in particularly powerful ways. Can you talk about what drew you to these themes and any other thoughts you might have in how they played a role in your novel? Well, they were in the original version, begun in my childhood, and I suppose that came from the fact that my father was of Native American descent. We grew up keenly aware that there was another side entirely to the story of how Pioneers Conquered America Because God Gave it to Them. When my dad was in school he frequently had to fight to defend himself. It was never an issue for me because I had white skin, but I hated it when people acted as though Indians were mostly dead and any remaining were drunks living in trailers. I knew the Red Man hadn’t vanished at all. There was a certain amount of bitterness about that, about the way the history books sort of pasted over the truth. I’m firmly of the “Custer had it coming” persuasion. But when you look at the history of the world, it’s always been that way, everywhere there were people: you’re living quietly in the place in which you’ve always lived, where your parent’s bones are buried and your children have been born, and then along comes someone more powerful who says “Guess what? My technology is more advanced than yours and my god said I could kick you out and take your land, so shove off.” Or, worse: “Don’t shove off; I’m going to put chains on you and make you mine, gold and silver for me”. Wherever cultures collide, it happens, I have always found it hard to get personally furious. But it worked its way into The House of the Stag, certainly. The House of the Stag has a rather unique narrative structure. I used the term “postmodern” to describe this in my interview, but could you talk about why you chose to have these unique breaks in story that expose the reader to a sort of metanarrative (a narrative that seems to comment on the fairytale/myth aspects of the story)? Because the story isn’t simply about Gard and his advancement through life; it’s the story of cultures colliding, the history of a race, the way in which people tell stories that create the masks worn by the heroes and the villains. And how much are people driven by storytelling conventions to become what they appear to the world? Terry Pratchett has proposed that humans are not properly Homo sapiens but rather Pan narrans: not wise men, but storytellers. Something I think a lot of people will enjoy about The House of the Stag is how realistic and unhindered by magic it is. While magic does exist, it is, to great effect, kept within reasonable boundaries, and only “flashy” when it serves a viable purpose in the narrative. How do you view magic in fantasy, or in general, and how would you describe your attitude towards it? Magic is a problem, for a fantasy writer, because in order to have a believable story the magic must have limits and structure. Which means you have to invent a whole science, a consistent one, that isn’t simply parroting the system devised by D&D players. Pratchett handles this well: Granny Weatherwax can stop a knife with her hand in a crisis and magically escape harm, but afterwards has to inflict the wound the knife should have made, because the magic has a price. Zelazny worked out some very plausible magic systems too. Peter S. Beagle’s magic follows the systems of the heart, and is thoroughly believable. My own feeling is that magic should be used sparingly, otherwise it loses its effect. Do you have future plans for this world or any of the characters currently established? Could you tell us a bit about your upcoming projects or anything you’ve done that you’d like people to know about? Yes indeed. 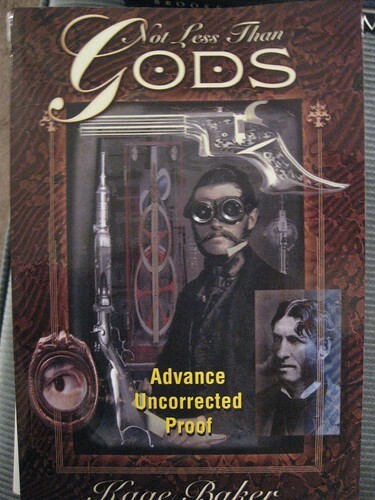 I have a steampunk novel coming out next year, Not Less Than Gods, and fans of the Company novels may be pleased to know it’s about the company’s Victorian-era predecessor, The Gentlemen’s Speculative Society, and features Edward Alton Bell-Fairfax. Beyond that I’ve just handed in another novel set in Gard’s universe but featuring an entirely different cast of characters. There’s a river in it, and a river god, and a girl’s journey. It will probably appear as The Bird of the River. 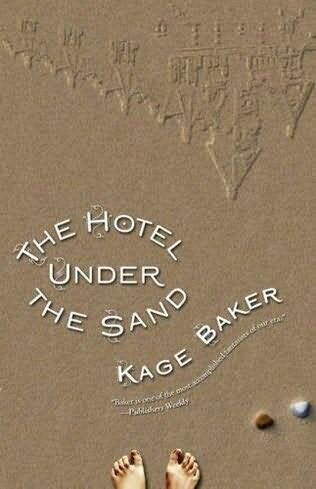 And my children’s book, The Hotel Under the Sand, has just been published for the ages 8-to-11 market. It’s sort of steampunk for kids. If you could offer budding writers one piece of unusual advice, what would it be? Kids, I mean this in the kindest possible way: Do Not Quit Your Day Job. Ever. Just because you get a book published doesn’t mean you will become instantly rich. At all. Go read what Robert Louis Stevenson wrote on the subject. Morris Dancing! It would bewilder them and introduce them to beer. They’d be so drunk and exhausted all the time they’d be unable to conquer us. Thank you for this most excellent interview by one of my favorite living authors! She's one of my favorites too. Absolutely loved The House of the Stag. I like her company novels, too, but The House of the Stag takes the cake.